Why are fast-food restaurants hiding condiments behind the counter? Why Are Fast-Food Restaurants Hiding Their Condiments Behind the Counter? Hot sauce was once considered an endlessly renewable resource, but no more. A few years ago, I started to notice something disturbing at my favorite fast-food chain, Taco Bell: Many franchises were starting to keep the hot sauce behind the counter. This meant customers had to request it from employees instead of just helping themselves. For diners who happen to enjoy, say, dousing their Nachos Bell Grande in revolting waterfalls of sauce, it meant saying, “Please, sir, I want some more” like some kind of overfed Oliver Twist. Around the same time, I noticed that McDonald’s seemed to be getting stingier with its ketchup, handing out one or two packets where once I would have been given grand joyous handfuls of Heinz. Employees would often give out only single servings of fancier behind-the-counter sauces like hot mustard and barbecue; last weekend, on a grim visit to a restaurant in Claremont, New Hampshire, I had to pay for them. In Manhattan, I read, some franchises were even charging for ketchup. Ketchup! Our national fast-food vegetable! Something was amiss with America’s fast-food sauces. In some ways we are experiencing a glorious flowering of condiment culture. The American market for condiments and sauces is about $6 billion, up from just over $4 billion in 2000. At the high end, grocery stores are bursting with small-batch mustards and artisanal hot sauces. And even in the fast-food trenches, every week seems to bring a new delight that would have been unimaginable to our ketchup-saturated ancestors. Taco Bell’s new “Crispy Chicken platform,” as a PR representative described it to me, features sauces like mango barbecue and jalapeño honey. Sriracha is everywhere, including Taco Bell and Subway. McDonald’s now lets you dip your McNuggets in spicy buffalo and sweet chili sauces. An investigation was in order, but I feared I would be stonewalled by restaurants’ PR departments. I first reached out to Taco Bell. Our history is long and deep. When my third-grade Sunday school teacher promised my class that he would buy those of us who memorized every weekly Bible verse for a year dinner wherever we wanted, I chose Taco Bell. As a kid, my go-to order was the bean burrito. Today my favorites includes the classic Soft Taco Supreme and the underappreciated beef Meximelt. 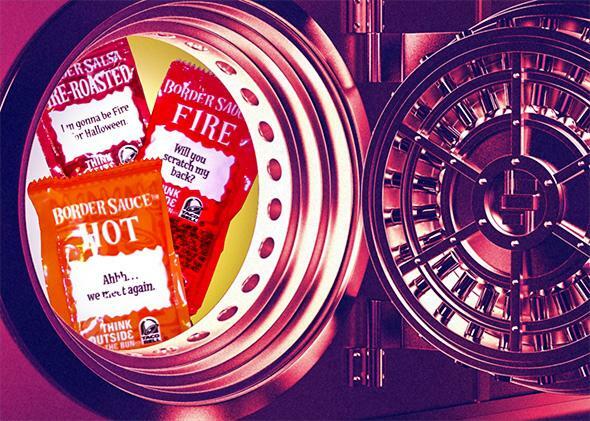 But one element has remained the same over the decades: fistfuls of Taco Bell hot sauce packets piled onto the paper-covered tray and squeezed onto just about every bite. The more Taco Bell’s food tastes like Taco Bell hot sauce, the more I love it. A McDonald’s representative told me by email that sauce placement is left up to franchisees in that chain, too. Most of the rest of her email was spent promoting a new regionally available menu item called Shakin’ Flavor seasoning, which customers use to spice up McDonald’s fries and Chicken McNuggets. When you order Shakin’ Flavor, you receive an extra bag and a seasoning packet for a “fun and interactive taste experience.” I’m going to be honest, I would order this. But I still had unanswered questions about ketchup and other sauces. At the other end of the generosity spectrum is Arby’s, where the Horsey Sauce flows like water. At the franchise I stopped into in Dallas recently, five sauces were on display: ketchup, honey dijon mustard, “Spicy Three Pepper,” the classic Arby’s barbecue sauce, and “Horsey Sauce,” a creamy, spicy horseradish topping. (My brother-in-law had enthused of the location, “That’s a really well-run Arby’s.”) Customers could pump as much as they wanted into little paper cups, free from the judgmental glares of employees. And when I asked the woman behind the counter for some to-go packets of sauce, she handed over six packets of Arby’s sauce and eight of Horsey. Each packet was a generous half-ounce, much larger than Taco Bell’s 7-gram, or quarter-ounce (two-squirt), portions. Later I spoke on the phone with Arby’s corporate executive chef, who I am pleased to inform you is named Neville Craw. Craw recalled a childhood in which he “would go to Arby’s to really basically just drink the Horsey Sauce.” Today, Craw said, sauces and condiments are “a huge area of focus for us,” because they give the customer the ability to customize and give Arby’s the chance to adapt to trends without changing their core ingredients: meat and bread. Overall, the average customer is looking for spicier, bolder flavors in her sauces. When I casually mentioned my brilliant idea for a super-spicy Horsey Sauce, he said “atomic” Horsey Sauce with wasabi had been tested in Chicago. For some historical context, I called up Tom Nealon, an independent historian and author of a masterful series of 15 blog posts about condiment history. The current passion for condiments is not a product of late capitalism or a degraded modern palate: Ancient Romans were crazy for fermented fish sauce, for example. In the early 19th century, an English inventor and cook named William Kitchiner developed the Magazine of Taste, a tabletop box of 28 condiments for mixing and matching; choices included syrup, lemon juice, essence of anchovy, pea powder, and something called “sauce superlative.” The English, Nealon said, passed their passion for condiments on to Americans. Nealon walked me through the progression from the range of 19th-century catsups (Kitchiner’s box included mushroom and pudding varieties) to the 20th-century dominance of tomato ketchup. The tomato version took off in part because Heinz developed a shelf-stable version in the early 20th century. But condiments are unusually susceptible to faddishness, Nealon said, and fast food helped cement tomato ketchup’s remarkably long dominance. Oches, the editor of QSR, is more sanguine about the receding of sauce from public view. “Ultimately if you start to implement some of the change at the store level, where you switch the expectation from not getting to grab handfuls of condiment packets and have to go up to the counter to ask, in time people will forget,” he said. “As Generation Z comes up, they probably won’t think anything of it. They probably won’t even remember there was a time when you could grab condiment packets willy-nilly.” Those of us who still recall the golden age must be keepers of its memory.